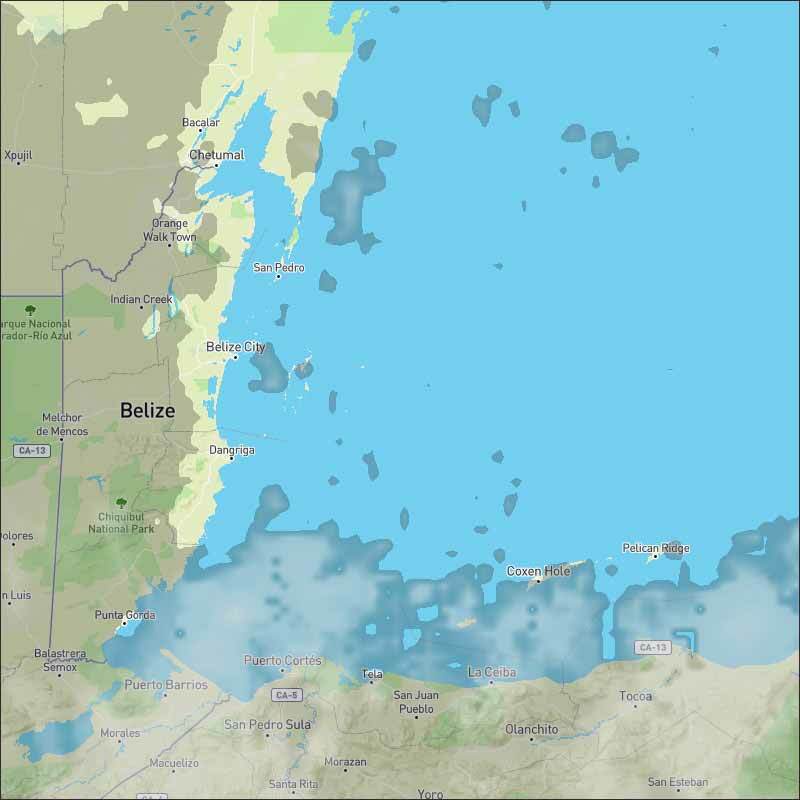 Belize NMS: Atmosphere becoming relatively moist. 24-hour forecast: Cloudy spells today and cloudy skies tonight. A few showers or periods of rain will affect mainly the south and some coastal areas this morning and tonight and inland areas this afternoon. General Outlook: A few showers, periods of rain and isolated thunderstorms will affect most areas of the country on Tuesday and Tuesday night. Today 5-15 kts Slight-Light Chop 1-3 ft A FEW MORNING SHOWERS OR PERIODS OF RAIN, ESPECIALLY SOUTH. Tonight N-NE 5-10 kts Slight-Light Chop 1-3 ft A FEW SHOWERS OR PERIODS OF RAIN. Tomorrow NE 5-15 kts Choppy 2-4 ft A FEW SHOWERS AND ISOLATED THUNDERSTORMS. Outlook NE 5-15 kts Slight-Light Chop 2-4 ft A FEW SHOWERS, PERIODS OF RAIN AND ISOLATED THUNDERSTORMS. A surface trough is over the NW Caribbean from 21N86W to 18N84W. 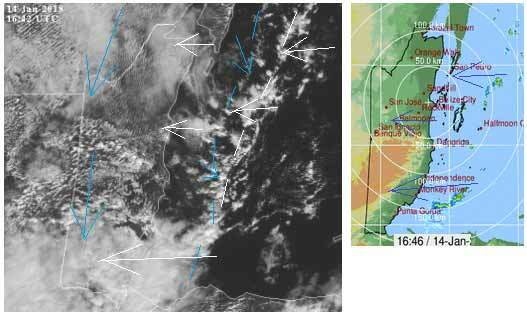 Isolated showers are within 120 nm of either side of the trough, mainly north of 20N. Additional isolated showers are embedded in the trade wind flow across the entire basin. Evening scatterometer data indicates fresh to strong NE winds off the coast of Colombia from 11N-13N east of 79W. Moderate to fresh trade winds cover the remainder of the central Caribbean, while mainly moderate winds cover the eastern and western Caribbean. The weak trough in the NW Caribbean Sea will shift W over the Yucatan Peninsula by Mon night. Fresh to strong trade winds will prevail in the S central Caribbean Sea through the forecast period. The winds will pulse to near gale force at night along the coast of NW Colombia. Mainly moderate to locally fresh trade winds will prevail elsewhere. Last edited by Marty; 01/15/19 05:57 AM. 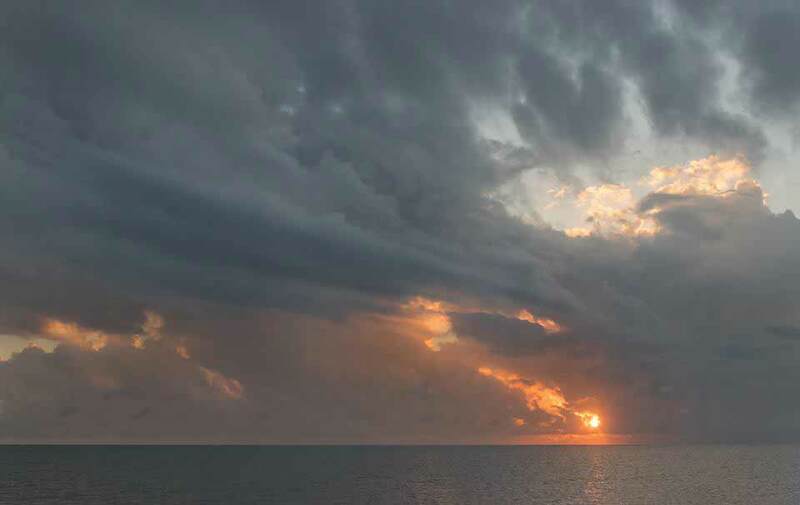 Despite the ominous dark cloud at sunrise, on Ambergris Caye this morning we have a sunny day with a calm sea and expected high temperature in the low 80's. We still have conflicting air flows, the Caribbean air from the east causing cloud over the south and rain out at sea and cool air from the north causing cloud over the north. Sunshine and patches of cloud over central Belize. Looks like today will be a changeable day, patches of sunshine, then cloud and sunshine, possibly rain in the south and a few scattered showers elsewhere this morning. The Cloud and rain picture. The low dark clouds are coming from the north and causing the odd sprinkle of rain. The white higher Caribbean clouds are coming from the east, making it more likely for the low cloud to drop rain.